You might think money and power are what motivate the people who make those huge holes in the ground to dig up vast quantities of black stuff to ship off to Asia. Banish the thought. All those mines, railways, ports and ships that make up the coal export industry are really all about a benevolent, generous spirit and the long-term well-being of the world. Don’t just take my word for it. Last week environment minister Greg Hunt talked about how Australia’s energy exports were helping “to bring hundreds of millions of people out of poverty”. Tony Abbott sings from the same songbook. In May the prime minister told miners that “it is our destiny in this country to bring affordable energy to the world” by exporting coal to poorer countries. Coal is king, he declared when opening a new mine in Queensland last week. On the same day in London, interviewed on the BBC about Australia’s “dirty” coal-exporting practices, treasurer Joe Hockey said we do it “so that nations can lift their people out of poverty”. The earnest mantra coming from Big Coal and its political friends is that exporting coal to China and India is a massive humanitarian mission. You could almost believe they mean it. But China and India don’t seem to share the love. Indian prime minister Narendra Modi says he wants to reduce his country’s dependence on coal and is seeking finance for a 10-year plan to generate 200 gigawatts of wind and solar energy. China now taxes imported coal and keeps raising taxes on coal-fired power. And only three months after Australia abandoned its pioneering carbon pricing system, China announced that it would bring forward its own national pricing scheme to 2016, two years earlier than originally planned. The burning of coal, mainly to make electricity, is the world’s single biggest source of greenhouse gas emissions. The burning of oil-based fuels is the second biggest, and so-called “clean” natural gas is another significant greenhouse pollutant. The International Energy Agency says that a safe climate future requires us to leave untouched at least two-thirds of all the coal, oil and gas that we know is still in the ground. I know of no government or industry challenge to the IEA analysis anywhere in the world. The Bank of England governor, Mark Carney, has advised companies, investors and policymakers that “the vast majority of reserves are unburnable” and urged them to incorporate long-term climate change into their planning. Yet for Australian governments, enthusiastically backing an expansion of coal exports, King Coal reigns supreme, and there can be no other way of looking at it. It’s a foolhardy position to take. This only partially explains why government ministers and miners got so upset last week about the Australian National University’s decision to sell its holdings in seven mining companies which the university determined didn’t meet its own “socially responsible investment” requirements. To Tony Abbott, the decision was “stupid”. Assistant infrastructure minister Jamie Briggs said it was “reckless”. Other angry outbursts came from Joe Hockey, Greg Hunt and education minister Christopher Pyne, not to mention an array of state government ministers. Industry didn’t hold back. 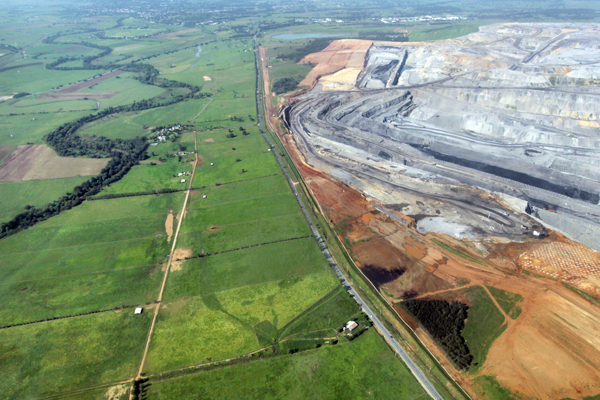 “Green imperialism at its worst” was the view of big NSW miner Whitehaven Coal. The Minerals Council of Australia thought it was anti-mining and anti-business. The Abbott government says it stands for business independence, yet it complains about a decision by an investing entity about where it wishes to put its money. That smacks of hypocrisy. To judge by the noise you’d think the ANU’s action was a massive sell-off, but the $16 million worth of shares involved were less than 2 per cent of the university’s investment portfolio and a much tinier proportion, about 0.03 per cent, of the companies’ value. The seven Australian companies, Iluka Resources, Independence Group, Newcrest Mining, Oil Search, Sandfire Resources, Santos and Sirius Resources, were identified in a commissioned independent review of companies’ environmental, social and governance policies and practices. There are no coal companies in the list and only two, Oil Search and Santos, are in the oil and gas business. But in various ways, all seven showed a disregard for investors’ concerns about how climate change might affect their asset valuations over the longer term. This is especially an issue in the fossil fuel sector, most notably coal, which must face the risk that as the impact of emissions is more widely appreciated their reserves will become stranded assets. The larger the reserve (such as those in Queensland’s Galilee Basin) the greater the long-term loss. The ANU is far from alone in deciding to sell shares of companies which fall short on the carbon test. Anglican and Uniting churches and local government superannuation are among increasing numbers of Australian entities that are divesting on this basis. They see what Australian governments, with Tony Abbott as the cheerleader, cannot. Coal as a global commodity is in terminal structural decline. Jingoistic fast talk won’t change that. All it’s doing is sending money, and our national reputation, down the drain. The ANU’s divestment decision is entirely defensible on purely business grounds. The behaviour of the Abbott government and its allies among the states is baseless, dangerous ideology. This entry was posted in Australian politics, business, investment, employment, carbon, carbon emissions and targets, changes to climate, climate politics, climate system, coal-fired, divestment, economic activity, economic threat from climate, energy, fossil fuels, investment, land use, leadership, mining, peak coal, renewable energy, solar, wind and tagged Australian National University, Australian politics, Bank of England, business, carbon, carbon emissions and targets, changes to climate, China, Christopher Pyne, climate politics, climate system, coal-fired, divestment, economic activity, economic threat from climate, employment, energy, fossil fuels, Greg Hunt, Iluka Resources, Independence Group, India, International Energy Agency, investment, Jamie Briggs, Joe Hockey, land use, leadership, Mark Carney, Minerals Council of Australia, mining, Narendra Modi, Newcrest Minng, Oil Search, peak coal, renewable energy, Sandfire Resources, Santos, Sirius Resources, solar, Tony Abbott, Whitehaven Coal, wind. Bookmark the permalink.